The 2014 National Drug Threat Assessment (NDTA) Summary addresses emerging developments related to the trafficking and use of primary illicit substances of abuse and the nonmedical use of controlled prescription drugs (CPDs). In the preparation of this report, DEA considered quantitative data from various sources (seizures, investigations, arrests, drug purity or potency, and drug prices; law enforcement surveys; laboratory analyses; and interagency production and cultivation estimates) and qualitative information (subjective views of individual agencies on drug availability, information on the involvement of organized criminal groups, information on smuggling and transportation trends, and indicators of changes in smuggling and transportation methods). 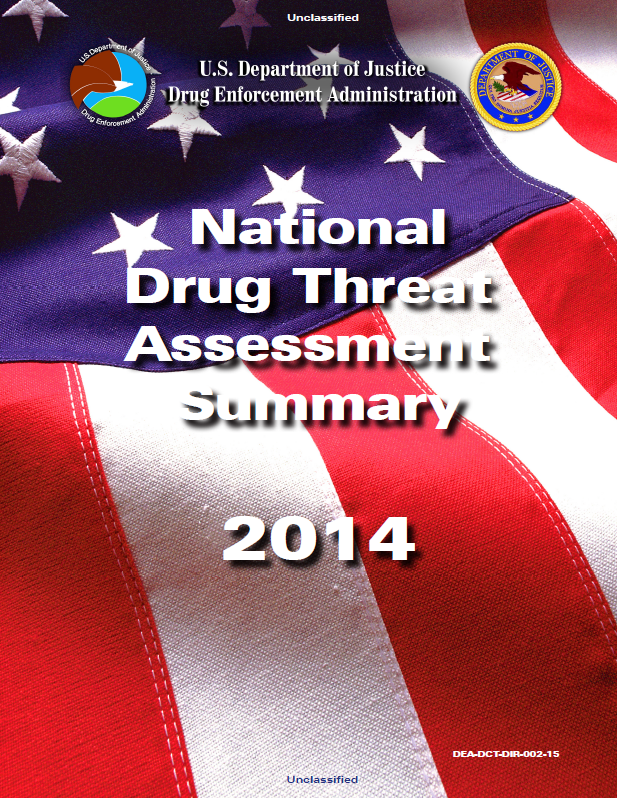 The 2014 NDTA Summary uses information provided by 1,226 state and local law enforcement agencies through the 2014 National Drug Threat Survey (NDTS). At a 95 percent confidence level, the 2014 NDTS results are within 2.59 percentage points of the estimates reported. NDTS data used in this report do not imply that there is only one drug threat per state or region or that only one drug is available per state or region. A percentage given for a state or region represents the proportion of state and local law enforcement agencies in that state or region that identified a particular drug as their greatest threat or as available at low, moderate, or high levels. The threat from CPD abuse is persistent and deaths involving CPDs outnumber those involving heroin and cocaine combined. The economic cost of nonmedical use of prescription opioids alone in the United States totals more than $53 billion annually. Transnational Criminal Organizations (TCOs), street gangs, and other criminal groups, seeing the enormous profit potential in CPD diversion, have become increasingly involved in transporting and distributing CPDs. The number of drug overdose deaths, particularly from CPDs, has grown exponentially in the past decade and has surpassed motor vehicle crashes as the leading cause of injury death in the United States. Rogue pain management clinics (commonly referred to as pill mills) also contribute to the extensive availability of illicit pharmaceuticals in the United States. To combat pill mills and stem the flow of illicit substances, many states are establishing new pill mill legislation and prescription drug monitoring programs (PDMPs). 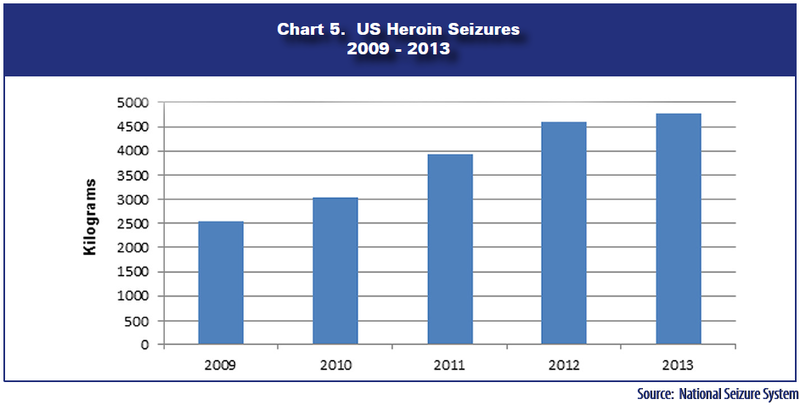 Heroin abuse and availability are increasing, particularly in the eastern United States. There was a 37 percent increase in heroin initiates between 2008 and 2012. Increased demand for heroin is largely being driven by a subset of CPD abusers switching to heroin because heroin is more available and less expensive. Further, some OxyContin® abusers switched to heroin after the reformulation of that drug made it more difficult to abuse. Many cities and counties across the United States, particularly in the Northeast and Midwest, are reporting increasing heroin overdose deaths. Some areas are also reporting overdoses due to heroin tainted with fentanyl or fentanyl being sold as heroin. Fentanyl is much stronger than heroin and can cause even experienced abusers to overdose. Several drug data sources indicate that methamphetamine availability is increasing in the United States; however, drug demand indicators are less certain. High methamphetamine availability is directly related to high levels of methamphetamine production in Mexico; domestic production remains low in comparison. 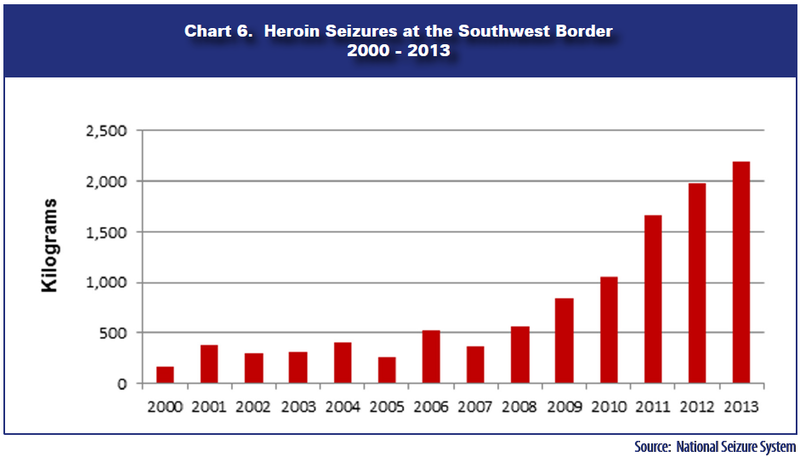 The number of methamphetamine laboratories seized in Mexico has increased significantly since 2008, and methamphetamine seizures at the Southwest Border increased more than threefold over the past five years. Mexico-produced methamphetamine has extremely high purity and potency levels. In 2012, purity levels1 averaged close to 90 percent, while prices remained low and stable. Cocaine availability rebounded slightly in 2013 compared to 2012. However, it remains stable at historically low levels throughout most domestic markets along the East Coast. These lower levels constitute a new normal in comparison to pre-2007 levels when US markets had high levels of cocaine availability with low prices and high purity. Since 2007 cocaine availability levels in the United States have fluctuated slightly but continued at consistently lower levels than prior to 2007. Marijuana is the most commonly abused drug in the United States. High availability levels are due to large-scale marijuana importation from Mexico, as well as increasing domestic indoor grows and an increase of marijuana cultivated in states that have legalized marijuana or passed state-approved “medical marijuana”2 initiatives. More people use marijuana than all other illicit drugs combined, and there has been an increase in the medical consequences associated with marijuana abuse nationwide. There was a 62 percent increase in marijuana-related emergency department visits between 2004 and 2011. Marijuana-related visits were second only to cocaine in 2011, and nearly matched the number of cocaine-related emergency department visits. The abuse of marijuana concentrates (“wax,” “butane honey oil,” etc.) is increasing throughout the United States. These concentrates can be abused using e-cigarettes or consumed in edibles, and have significantly higher tetrahydrocannabinol (THC) levels than leaf marijuana. In 2013, the THC content of leaf marijuana averaged 12.55 percent, while the THC content of marijuana concentrates averaged 52 percent, with some samples testing over 80 percent. Highly flammable butane gas is used to extract the THC from the marijuana leaf, and has resulted in explosions, injuries, and deaths. The abuse of synthetic cannabinoids (“K2,” “Spice,” “Herbal Incense”) and synthetic cathinones (“bath salts”) remain a concern, as these drugs are still available in convenience stores, head shops, gas stations, and online. Additionally, synthetic designer drugs being sold as “Molly” have become increasingly available and are sold as a substitute for methylenedioxymethamphetamine (MDMA).